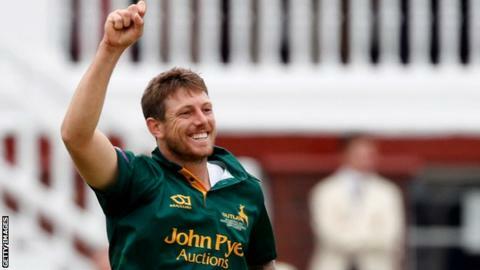 Nottinghamshire have re-signed Australia Test bowler James Pattinson for four months of the 2019 season. The 28-year-old will be available for seven County Championship fixtures, as well as the full One-Day Cup campaign. Pattinson, who will play his first game in the One-Day Cup on 19 April, helped Notts win promotion to Division One of the Championship in 2017. "His pace and international pedigree make him an exciting addition," said Notts director of cricket Mick Newell. "If he performs anything like he did during the previous spell, we'll be very happy." Pattinson, who made the last of his 17 Test appearances for Australia against New Zealand in February 2016, is the brother of ex-Notts bowler Darren. He will miss the first two four-day games before playing in the One-Day Cup fixture against Lancashire at Trent Bridge on 19 April, departing after the home Championship match against Surrey starting on 13 July. "I have special memories of my time with the club," said Pattinson, who has taken 229 wickets at 22.45 during his first-class career, plus a further 119 dismissals in white-ball competitions. "Having the opportunity to call Trent Bridge my home is something I really value."